Synthetic molecules are essential for many products in our lives: medicines, crop protection agents or special materials such as Teflon. These molecules have several components, which can be combined in a variety of ways, resulting in different properties. Both so-called piperidines and fluorinated groups are particularly important. Piperidines are small, ring-shaped chemical compounds. Since, as a result of their particular properties, fluorine atoms bring about dramatic changes in the properties of certain products -they are often integrated in pharmaceuticals. Hence around twenty percent of all medicines sold worldwide contain fluorine. Up to now, however, combining fluorine atoms and piperidines has always been an extremely laborious process. 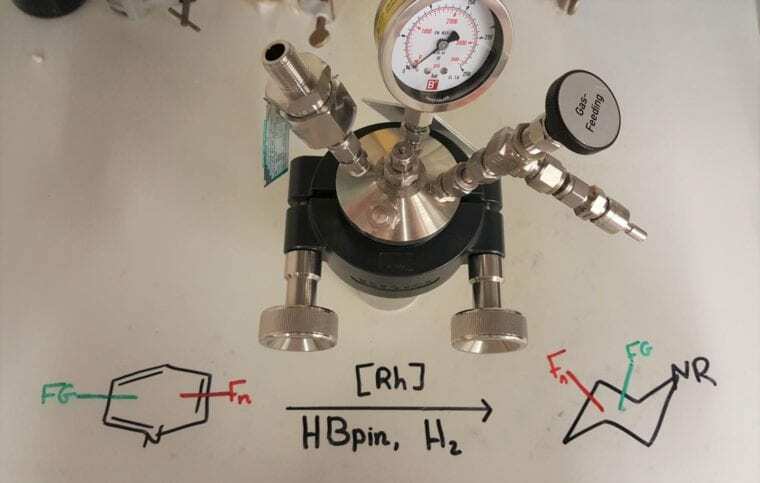 Now, for the first time, chemists at the University of Münster have developed a new, easy to do synthesis method for producing such fluorine-bearing piperidines. The study – written by Dr. Zackaria Nairoukh, Marco Wollenburg, Dr. Christoph Schlepphorst, Dr. Klaus Bergander and Prof. Frank Glorius – has just been published in the online edition of the Nature Chemistry journal. The method developed by Frank Glorius and his team runs in two consecutive steps – but in the same vessel: the starting molecules used are easily accessible, fluorinated pyridines, so-called “aromatic” compounds. These compounds are flat and have a particularly high stability – which makes them inert for many chemical processes. In the method now published, the first step involves removing the aromaticity (“dearomatization”). This makes the second step possible, in which hydrogen atoms are transferred specifically to one side of the ring system (hydrogenation). The resulting fluorinated piperidines are now – in contrast to the aromatic starting substances – no longer flat, and this can be helpful for the formation of complex three-dimensional structures. For both reactions, the chemists use a catalyst. “Catalyst” is the term applied by chemists and biochemists to enzymes or other molecules that speed up the stages of a reaction or, indeed, make them possible at all. The results can now be used to produce new types of valuable components, previously unavailable, for research in the fields of pharmaceuticals and agrochemicals. “We hope that these components can soon be produced in large quantities,” says Frank Glorius. The Münster University chemists want to use part of the grant of 2.5 million euros recently awarded by the European Research Council to work on a “renaissance” of the hydrogenation of aromatics, leading to the efficient production of such new types of molecule. “We’re going flat out in our efforts to try to understand more about the mechanism of catalysis, so that better catalysts can be developed and the potential of these reactions can be exploited to the full,” says Glorius.